Our latest product review for The Old Schoolhouse is Big IQ Kids. I had never heard of BIG IQ Kids until just a few weeks ago. Now, I'm wondering how we ever survived without it! I am, however, getting a little tired of my kids only wanting to work on Big IQ Kids!! I'd like to tell you about this web-based program that encompasses math, spelling, vocabulary, and states. We were given a one year, full premium membership to all areas of the site. You can use certain areas of the site for free, but if you want your students' progress tracked or for them to have the option of advancing once they master a concept, then you should go for the paid version. The paid version also allows your children to customize their "buddies" and have full access to the games (and the games are a HIT!) For pricing options, click here. I was going to attempt to explain it all to you, but Big IQ offers a nice chart on their site, so check it out. Each of my children were provided with their own login and password and were given the opportunity to create their own "buddy". I made Big IQ Kids a bookmark in our browser, so any time it was computer time they could easily click on the bookmark and get to work. I new they would never be off task because: a) they liked the program so much they stuck with it, and b) progress reports were mailed to me and I could check them online as well. What Does Big IQ Kids Offer? All of Big IQ Kids' activities can be tailored to fit anyone pre-school all the way through adult. 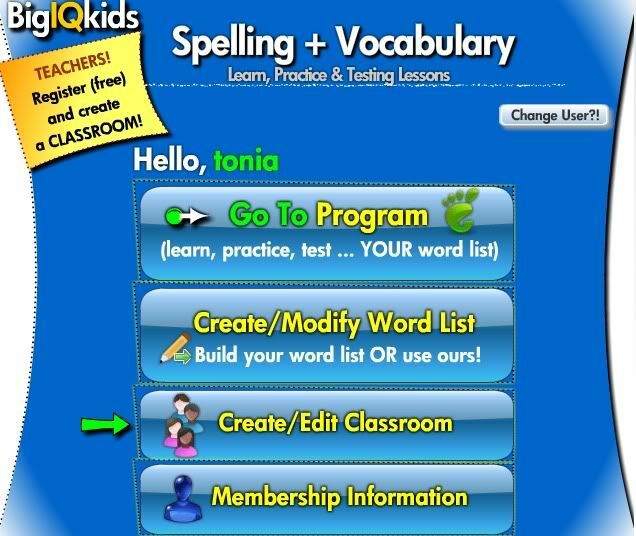 A complete spelling program - with ready-made lists by grade level OR you may enter your own list. We used the latter option and used Big IQ activities to reinforce our spelling lessons. Both of my children enjoyed the lessons, tests, quizzes, and fun games. A vocabulary program - This was very closely linked to the spelling program (using either your own list or a ready-made list), and to be honest, we didn't use it that much. My daughter found it not as interesting as the rest of the activities in Big IQ Kids. 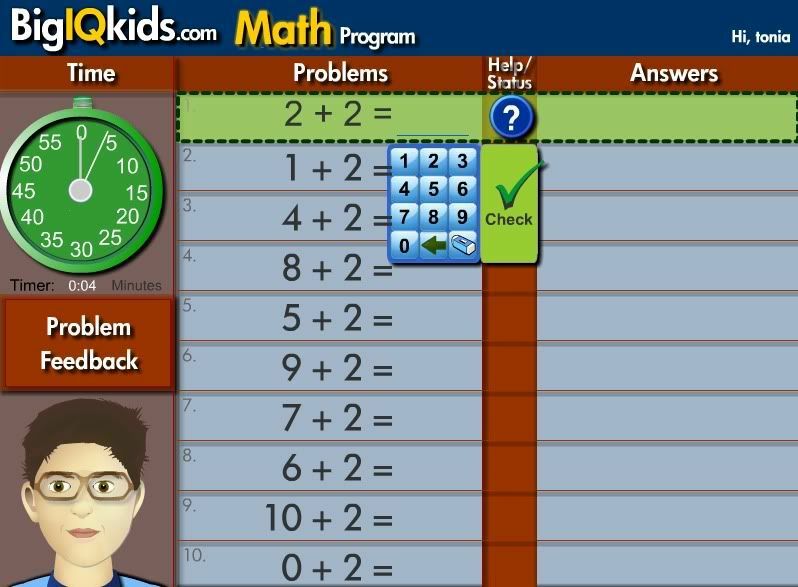 A complete math program - Each day my children would do a drill with 50 problems. I could customize what types of problems I wanted them to do, which I really liked. Notice the clock (a cool feature!). A U.S. States program - This is what we used the most. 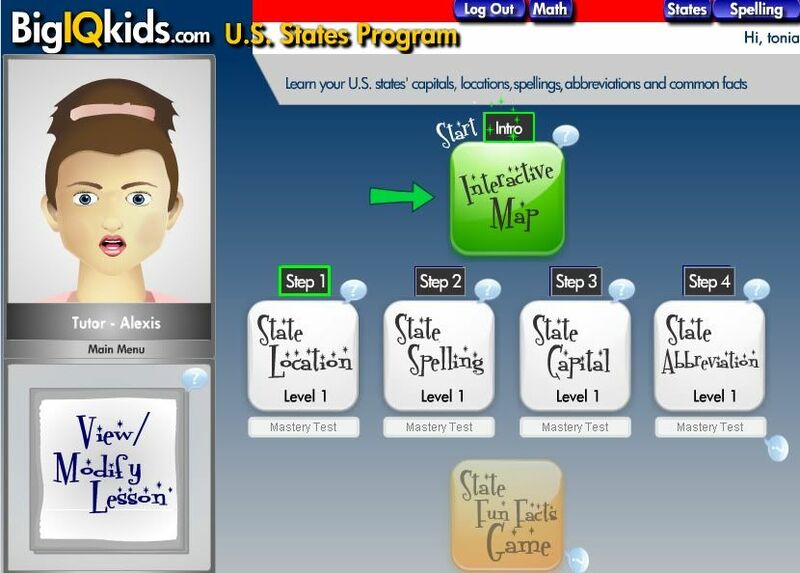 There were four areas of the states program: spelling, abbreviations, location, and state capitals. Each area had different levels to progress through at the student's own pace. Spelling and Vocabulary Competitions -- kind of like your own virtual spelling bee -- lots of fun! The lessons weren't too long. It's good that mom gets an email when I complete something. This program was a huge success in our house. We used Big IQ Kids daily. I loved the customization options, parent reports and the fact that I could enter my children's spelling lists. I would recommend (if you are seriously interested in Big IQ Kids) to try the free membership for a bit and decide if you want to invest in the premium membership. Be warned: there could be fighting over the family computer because of Big IQ Kids! The only negatives I could find were the synthesized voice and that it wasn't compatible with the iPad. The price is a little steep, but if you would make this an integral part of your curriculum, you might think it's worth the investment. In my opinion, however, those aren't deal breakers for our family. In fact, now I see why this product won a blue ribbon award from TOS last year! 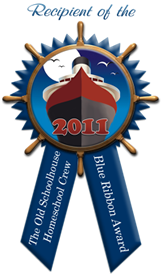 If you'd like to see what other TOS Crew members are saying about this program, visit the Crew Blog!